The iPhone 6 marked a key turning point for Apple, as it introduced a new design and larger screen, leaving the iPhones of old in its wake. The iPhone 6 is now several years, and iPhone iterations, old, but it's still available and there are some great deals to be had for those looking for a low-cost Apple handset. Sure, it's not nearly as fast or powerful as Apple's new iPhone 8, this is 2014's still-impressive flagship that you may want to consider next to the iPhone SE. So how did the iPhone 6 come about? Well, back in 2013, despite record sales, the Cupertino brand was heading for a fall. It had been trading on the same phone for four years, and something big was needed to keep it current. So with that, the iPhone 6, and its bigger brother, the iPhone 6 Plus, were born to keep Apple at the sharp end of a market that was starting to lust after powerful, big-screen smartphones with clever and premium design. The iPhone 6 addressed a number of problems Apple had developed, coming with a much larger screen (although not dramatically increasing the size of the phone) a boosted processor, better camera, improved battery and - crucially - overhauled design. Much of the ground work that went into the iPhone 6S was done here, with the iPhone 6. This is the sixth iPhone I've reviewed, and there's a distinct sense that this one is really rather different. I wrote in 2013 that Apple was becoming more aware that the time when it could define what consumers would buy in the smartphone was ending – and with the 4.7-inch screen, it clearly had to admit defeat in the smaller screen market. There will be some who will miss that 4-inch screen size, maintaining that they don't want a bigger display on their phone – but nearly all of those people won't have spent any appreciable time with a larger device, and I believe that a good portion of you thinking you need a smaller phone will quickly come to appreciate the power a bigger handset brings, without compromising quality. Apple's now appeased those longing for a new 4-inch handheld though, with the launch of the iPhone SE. It sports the specs of the iPhone 6S, uses the body of the now-discontinued iPhone 5S and sports a lower price tag than the iPhone 6, giving the latter some tough new competition. But while the iPhone 6 has answered a lot of the problems I've had with previous iterations of Apple's handsets, there are some issues that still swirled when I handled the phone for the first time – and many of them persist even now that the iPhone 6 has been superseded. Why did Apple decide to not join the masses with a really high-res screen? Why is the iPhone 6 still one of the most expensive phones on the market? Has Apple done enough to improve the quite dire battery life of previous models, especially at a time when many high-end Android phones are easily chugging through a day's worth of hard use without thirsting for a charger's caress? Let's take a quick look at the price – and it's not pretty. At launch, you were looking at $649, £539 for the 16GB version, $750, £619 for the 64GB option and $850, £699 for the 128GB model. You can no longer purchase the iPhone 6 through the Apple Store, but it can still be picked up new if you hunt around. Since its launch, a new 32GB storage variant was introduced, and that's the handset most commonly available today. SIM free you're looking at an iPhone 6 price of £329 (around $430, AU$570) for the handset, which places it firmly in the middle of the market. If you're looking for a cheap iPhone that still has Apple's full backing (i.e. it still sells it through its online store) the smaller iPhone SE will set you back £349 ($349, around AU$549), and sports newer internals than the iPhone 6. Let's take a look at the first thing most people will wonder about before picking up the iPhone 6: how will it actually feel in the hand? Well, with the Apple iPhone 6 we're looking at one of the thinnest and sleekest handsets in the market – still. It's got a strong combination of metal back (which feels exceptionally premium, borrowing bucketloads of design language from the iPad Air) and the way the screen curves into the chassis gives it a slight lozenge feel. The iPhone 6 looks the business, and at 6.9mm thin it's very nice to hold, though phones like the Samsung Galaxy S6 and Moto Z has since edged it out at 6.8mm and 5.1mm thick, respectively. I do still feel that phones that push harder on ergonomics are a better choice though – the HTC One M9 bows out at the back and fits in the palm a little better – but that's quibbling. This iPhone just feels really well made. Apple has always favored a flatter phone than the rest of the market though, and placed on a desk it looks great. It does feel great in the hand too, but as said others impress more if I'm being hyper-critical. There's also the issue of the large plastic strips that flow through the top and bottom of the device. Given metal is a nightmare material to try and get radio signal to penetrate, these are clearly there to offset that. While the plastic does seem to give good signal performance for the most part, it's nothing amazing, and to my eyes they're a little unsightly and ruin the sleek back of the iPhone 6; their presence seems at odds with Apple's design ethos. The other big design change is to the power button, which has now been moved to the right-hand side of the phone. This makes a lot of sense and, given the phone is now a larger device at 138.1 x 67 x 6.9mm, hitting the top of the handset is a much harder task, so moving the button is the right thing to do. Like the rest of the exterior buttons, the power key is raised and easy to hit in both left and right hand modes. It's metallic, and crucially doesn't have the same rattle that I criticized on the iPhone 5S and iPhone SE. However, that doesn't mean the metallic keys don't have a little wiggle to them. Running your hand up and down the sides idly will result in you noticing a very slight looseness to the power and volume buttons... I'm in danger of being too critical here, but for the price it's not the sort of thing I expect to see. The other important design change here is the camera now protrudes slightly on the rear of the phone. It's good to see that happening, as it shows that Apple isn't willing to compromise on camera quality in order to just whack in a thinner phone. The protrusion is a little worrying in that laying the Apple iPhone 6 down flat on a table could see scratches appearing, but the sapphire glass that covers the lens should ensure that's pretty safe. The rest of the iPhone 6 is very similar to the iPhone 5S, with the speakers at the bottom flanking the Lightning port. Well, I say speakers: it's just the one speaker, but thanks to the slightly elongated bottom of the phone you won't cover it when holding the phone in landscape orientation. This was irritating when trying to game or watch a movie without headphones on older iPhones – but this upgrade, combined with the lightness of the iPhone 6, means you won't have a similar problem for the most part, as the hands sit lower and free of the speaker generally. 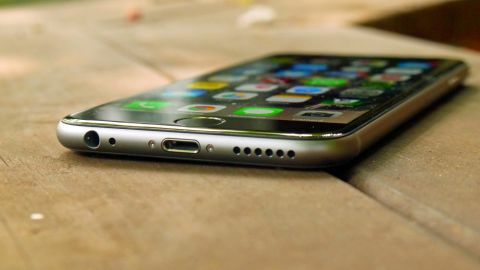 Sadly the headphone port still resides at the bottom of the iPhone 6, meaning you'll still probably get your phone out of your pocket the wrong way around when listening to music. Going back to the iPhone 6 after a prolonged spell using the iPhone 6S as a daily driver, it's remarkable how much lighter the older phone feels in the hand. You can feel every one of those extra 14 grams, and it's the one area in which the newer iPhone suffers by comparison. Let me make one thing very clear though: the Apple iPhone 6 is another iconic handset in terms of design for Apple. It's not the best looking on the market (I'm still giving that title to the HTC One M9), but it's definitely right up there, and for the price I'd expect nothing less. At launch, the iPhone 6 was available in Space Gray, Silver and Gold, but you might have a hard time finding your preferred color now since Apple no longer sells the phone. Fast forward to today, Apple's iPhone 7 is offered in a few more colors: Jet Black, Black, and Rose Gold - a variant that was introduced alongside the iPhone 6S.